What you’re hearing is weather for the blind, a website streaming a constantly changing, never-the-same sound experience. But the really intriguing part is where the sound comes from, and for what purpose. While an estimated 6.6 million US citizens have some form of visual disability (estimated at 285 million worldwide), and an estimated 1.3 million are legally designated blind, most are still able to perceive enough light to the degree that their circadian rhythm is established by the rise and setting of the sun. However, an estimated 100,000 people suffer total blindness, and of them an estimated 70 percent suffer a condition known as non-24, where one’s circadian clock is unestablished and free-running sleep is often a factor. While that might just sound like a sleeping pattern disorder, non-24 has other serious health side-effects ranging from headaches to lack of muscle control and even hair loss. All of this might seem insurmountable, but being completely blind doesn’t affect your hearing. For some, the sense of hearing is amplified (think of the portrayal of Kent Cullers in the 1997 film Contact). That’s where the brilliance of weather for the blind comes in. The brainchild of Quintron, the same maker who many years ago brought us the Drum Buddy, this project went through several iterations before completion last spring while the artist was in residency at the Robert Rauschenberg Foundation in Captiva, Florida. A prototype installation of the project can be seen in the video below, and resembles a contraption you might see in Goonies. Now, the circuits are contained inside a beautiful “base station” enclosure known as Weather Warlock, an all analog synthesizer with sliders and knobs to control output of conditions like rain speed, sun, drone phase, and wind tones. In one installation, the base station was combined with a PVC pipe armature stuck in beach sand, which contained the sensors and resembled common weather vanes and DIY stations. Nowadays the base station is installed at Spellcaster Lodge (aka Quintron’s living room) on St. Claude Avenue in New Orleans’ 9th Ward, with the sensors likely fitted to the house’s exterior. 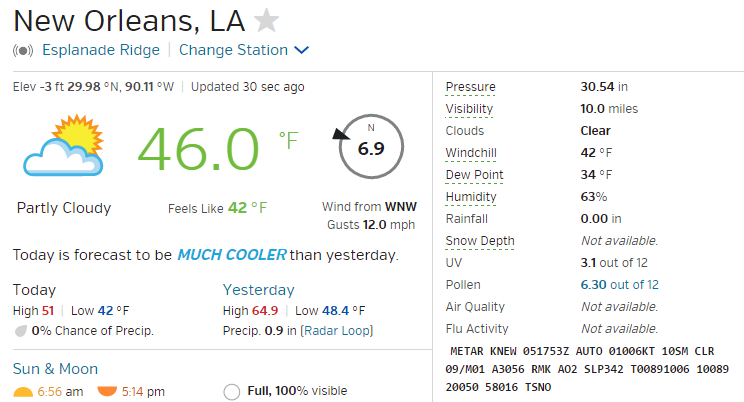 Having listened to the audio feed for some time now (and compared what I’m hearing to what is shown in the video), I can tell there is partial wind speed with no rain in New Orleans at the moment; glancing at Wunderground’s forecast shows winds gusting up to 12mph with no rain and partial cloud cover, with temperature in the mid 40s. Exactly what I’m hearing. While not FDA-approved for non-24, weather for the blind at least attempts to acknowledge the issue blind people face in their geography. And it shows how makers and artists creatively think through challenges to construct projects that use sensors to interpret the world around them. From weather to sound, from art to life; if nothing else it’s simply soothing to listen to. I listened to the stream the entire time I wrote this blog, and yes, it is relaxing. “Special audio events” occur daily during sunrise and sunset. Those times are available on the project website; New Orleans is located in the Central Time Zone. If you live near New Orleans, Quintronics will be performing the Weather Warlock live on January 18 at St. Maurice Church in the Lower 9th.